It was close to 9am by the time we left Charters Towers on Saturday morning. We are all fuelled up and on the road south to Emerald. Much the same scenery as yesterday, but with a few more cars and less road trains. We drove through Emerald just after 2pm, so we agreed on 3.30 as our “stop and look for accommodation” time. We’d given up on motels and campgrounds, and were looking for the local pub, so we didn’t have to go too far for dinner and drinks. We found a pub in a whistle-stop town called Dingo. I went in see about a room. I soon came back, all the rooms were out of action as the owner was in the process of painting them. I guess there’s not too much call for accommodation in these parts, to have all his rooms out at once. 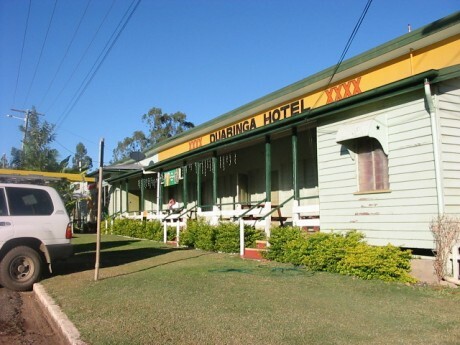 He did however, tell me that Duaringa, another 30 kms up the road, would probably have rooms. So off we went again. 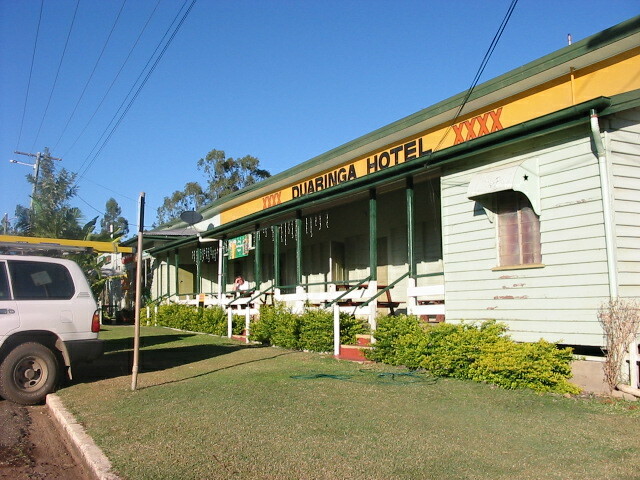 Sure enough, a little pub, the Duaringa Hotel had rooms, we dragged our weary backsides in for the night. Our room was interesting, to say the least. The inner walls were not lined at all, just the painted timber planking that is the outside wall. You could see daylight through one or two planks. There were no windows, just two wooden doors, one on the opposite wall to the other, a hand basin on one wall with only one tap – cold of course, showers and toilet were communal down the corridor. The bed at first glance looked as though the blankets had just been pulled up after the last person got out of it. Bunched inside their cases the pillows as if they had just been slept on the pillows were all different colours. The only other item of furniture was a large old-fashioned wardrobe, complete with cockroach bait. But for all that, we felt quite comfortable being here, and we didn’t feel nearly as ripped off as we did at last night’s stop. We brought our bags in and made our way out to the bar. I bought a beer for myself and a glass of wine for Al. Unfortunately the wine, poured from an open cask, must have sat in their fridge for a few years before we came along. It was deep yellow in colour like a dehydrated pee with the most disgusting flavour Al had ever tasted. How the barmaid couldn’t smell it as she poured it, I’ll never know. Al tried to take a polite sip of the stuff, while the owner was chatting to us over the bar. Then we moved to another part of the bar, which was only about 10 feet away down the corridor from our room. Al quickly and quietly took her drink into our room and washed it down the sink.She had to settle for beer for the rest of the night. At 5.30pm, I wandered into the dining room and put the TV on. No-one else was in there yet, I found the channel with the rugby league and we settled down for the evening to watch the games. Horse racing is on all the other TV’s in the place. As we were occupying a table in the dining room we thought we’d better order a meal. The menu didn’t turn us on very much, too much meat and not enough variety. We’re in a pub, so you shouldn’t expect too much. As this was the second pub feed in as many nights, Al thought she’d stay away from the fried and battered things, so she ordered the pork chops and veges. Well there’s no good reason for anyone to complain about the lack of food, when the plate arrived, she had two huge pork chops that totally covered the plate. On top of that a pile of fried chips, a few veges poked out from under all this, poured all over, a mound of gravy. What happened to apple sauce anyway? There was more food on my plate alone than we would have between us at home in one meal. I had ordered the mixed grill, and it looked just the same as Als with a few rashers of bacon added. It all tasted good, but we both left enough on our plates to still feed another two people. It’s no wonder that Australia is the second fattest nation in the world next to the US. And Queensland is the fattest state in the country. While we were still sitting in the dining room, a guy called Simon came in and introduced himself to us. He said he worked for the power company based in Mooloolaba. He and a few others have stayed in this pub for a few weeks while they’ve worked in the district. Simon had washed some clothes earlier and needed them for work in the morning. He had negotiated with Mick and Marilyn (the couple who ran the pub) to dry his clothes. So he had the wall heater in the dining room on full with his shirt and a pair of trousers draped over some chairs, and the chairs were standing on the tables so they were in front of the heat. Every couple of minutes he re-arranged the wet clothes. Earlier, some of the locals had come in for dinner and the younger ones had the juke box going. Their choice of music was not the same as ours, and from our room the whole building shook with the vibrations. We couldn’t help wondering how long into the night these guys were going to rock, but by 8pm we realized the place was relatively quiet. Most of them had gone and by 9.30, after watching two games on TV, we were almost the only ones left up, typical!. We went off to bed and the pub pretty much closed up behind us. We thought with it being a Saturday night, we were in for a rough one. Did I mention the coal trains? All around this area coal is mining, and the trains run one after the other, with a break of what seemed like only 10 minutes, before the next one rumbles by. Pulling these trains are two diesel engines with another two in the middle, the trains are a kilometre long sometimes longer, with dozens and dozens of cars, Where the railway line crossed the road was about 20 yards away from our bedroom door. I’m sure I would woke with every train that rumbled and clattered past, but after we’d gone to bed, I never heard the train’s whistle. It took us until 7am to suss out Marilyns continental breakfast is complimentary. I haven’t heard that term used for a while now. But brekkie was free, so we helped ourselves to coffee, toast, cereal and fruit juice. For all the apparent roughness of the place, everything was kept wonderfully clean. We left shortly after breakfast and both agreed that a really interesting holiday would be to travel around the country staying only in the small-town pubs and hotels. They’re nearly always friendly, and there’s always some interesting characters there happy to chat.